This show is a delight and funny and sad and ultimately hopeful. Working with themes of growth and loss and change and generosity, love and unexpected friendship, the Reston Community Players are mounting a superb production. The staging is impeccable, the performances first-rate, and the lighting and sound pitch-perfect. When a play leaves you wanting so much more, it’s a good sign. 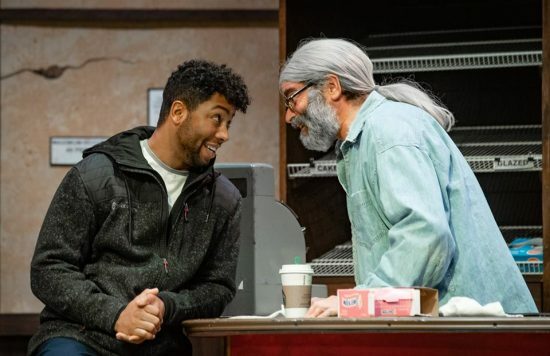 ‘Superior Donuts’ is a pleasure and a privilege to see. “Superior Donuts” is the name of a donut shop in a run-down area of Chicago, known as Uptown. It is a family business, started in 1950, by Arthur Przybyszewski’s (Michael Karfen) parents (and from here on out, he is known as Arthur because I am not typing that name again. Full disclosure—my father’s family was also Polish and he refused to type the original family name; it was exhausting.) The action takes place in December 2009 and January 2010 so it has been in existence, clinging by its fingernails, for 60 years. Arthur’s ex-wife Magda has died and he hasn’t seen his daughter since the divorce (they moved to North Carolina) and he is becoming erratic in keeping the business open. He hires Franco Wicks (Bryce Monroe) as his assistant, and his, and the denizens of the area, lives start to change. It’s a very human and delightful journey. The other characters include two beat cops—Officer James Bailey (Matthew McCarth) and Office Randy Osteen (Mattie Cohan); Lady Boyle (Sally Cusenza); Max Tarasov (Tel Monks); Kiril Ivankin (Tice Rust—he’s the good muscle and hysterical); Kevin Magee (Michael King) and Luther Flynn (Ian Mark Brown—the bad muscle). Uptown is beginning to emerge from decades of neglect and Max, who wants to expand his electronics/video business, is looking to buy Arthur’s business. Kiril works for him. You know the area is on the verge of gentrification because they have a Starbucks, but as Franco says, “You can find a Starbucks in a wheat field,” as he is trying to persuade Arthur to up his selling game. The job interview is one of the funniest scenes I have ever witnessed. Everybody has secrets and when it really counts, the neighborhood rallies around Arthur and Franco, in a scene that is ridiculous and grim. Franco may have done something stupid, but he and Arthur are theirs and they’re not going to let the loan shark, Kevin or his muscle, Luther, get away with his bad acts. Monroe is brilliant as Franco. He is just 21, smart and wise-cracking and vulnerable and has so much energy that he sort of just drags everybody in his wake. The depressed Arthur is, in the end, no match for him, but he is also just what Franco needs. His comedic timing in this piece is flawless. Oh, and Monroe can sing and dance too. Karfen is especially lovely when he tries to court Randy; you cringe at his fumbling and stumbling, and marvel at her generosity in overlooking his nascent attempts at connection. As the alcoholic, imperious, rude, homeless Lady, Cusenza imbues the role with some dignity and a surprising amount of depth. She reminds us that the homeless are very human and worthy of respect as survivors. The playwright, Tracy Letts, has written a play with legs–this has lasting power and is reassuring about our mutual humanity. This is not a bad thing. The stage design, by Maggie Modig, is impeccable. It is detailed and the backdrops give a glimpse of the cold wintry Chicago streetscape; when the actors enter and exit, they actually look like they are walking outside. Seth Ghitelman directs the cast with near perfect timing. The pace is brisk without being rushed and helps to give the sense of an area on the move, and the people living there moving along with it. Periodically the action stops as Arthur takes a stool and addresses the audience directly with his backstory, and this moves fairly briskly as well. In the end, you want to spend more time with these people and find out what happens to everybody next. Will Franco get his book rewritten and go back to college? Will Arthur and Randy nurture their relationship into a commitment? Will Kiril learn more than hello and thank you? Will Max become the next electronics king of Chicago? Will Officer James and his unseen wife continue their sci-fi convention cosplays? Is this the beginning of the end for the loan shark? And can Lady find any peace, or is this as good as it gets for her? And that name—Arthur’s father named it Superior Donuts because the sign maker charged by the letter. Advisory: Fight, drug use, some adult language. 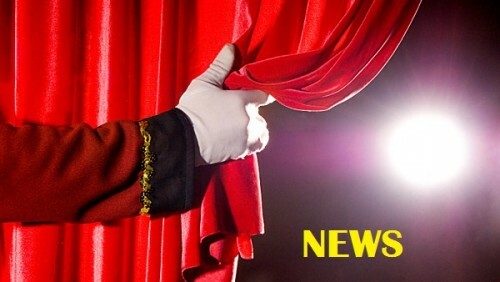 Running Time: The show runs about 2 hours and 30 minutes with a 15 minute intermission. “Superior Donuts,” runs from January 18 to February 2, 2019, at the CenterStage at the Reston Community Center, Reston, VA. For more information, please click here.